The SelfServ 88 is NCR’s premium free-standing drive-up ATM. Make ATM transactions available to your customers from the convenience and security of their car. Fully weatherized, the SelfServ 88 may be ordered in several variations to suit your business needs. 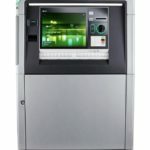 As a multi-function, bunker or island style ATM, the SelfServ 88 may be ordered in a cash dispense only mode, as a deposit imaging ATM, and as ITM-ready. Mixed cash and check deposit and bill payment are among the benefits of the dynamic features offered by NCR. With built-in heating and air conditioning, the 88 is made for severe conditions. We can provide a branded canopy to protect your customers from the elements while they conduct transactions without having to leave the car. We include skimming protection on every ATM and ITM we sell. We have the latest in compliance solutions for remote patch management and anti-virus. Contact us for a quote on the NCR SelfServ™ 82 and be sure to ask about our service!